Home Unlabelled BREAKING NEWS: Man Sentenced To Prison For Stealing Ram. BREAKING NEWS: Man Sentenced To Prison For Stealing Ram. An Abuja Grade 1 Area Court in Karu, Abuja, on Friday sentenced one Mr. Musa Victor to three months imprisonment for stealing two rams after he had pleaded guilty to a count charge of theft and begged for leniency. 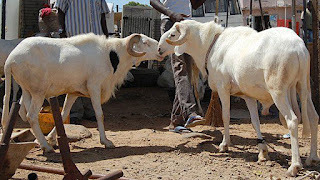 The Judge, Mr Hassan Ishaq, however, gave the convict an option of N7,000 fine and ordered the convict to assist the Police to locate the owner of the rams. The Prosecutor, Vincent Osuji, had told the court that Habibu Usman of Abattoir Market Association, Karu, reported the case at Karu Police Station on Sept. 28, when the convict went to the abattoir with two rams, looking for a buyer. He said that when Victor was questioned how he came about the rams he could not give any satisfactory reply, which led to the convict being arrested and taken to the association’s office where he confessed he stole the rams from an undisclosed location in Kuruduma, Abuja. The prosecutor said the offence contravened Section 287 of the Penal Code.